At Seniors Helping Seniors® Northern NY, we have a passion for meeting the needs of seniors in a way that provides both dignity and a sense of camaraderie. Our owner(s) Dianne Nugent-Ward, Joanne Nugent-Ward firmly believe we can do that through serving seniors in our community, which includes: Jefferson, Lewis, St. Lawrence Counties, and surrounding areas. 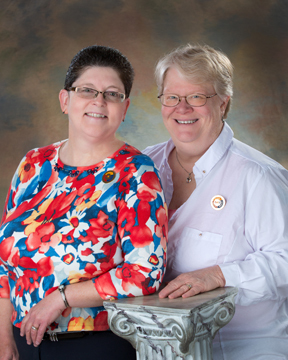 Dianne and Joanne work with family members to talk about care options for their loved ones. They can be a sounding board for weighing pro’s and cons for future care plans as well as assist in resolving problems related to Social Security, Medicare and health insurance. Both Dianne and Joanne have had career paths that have led them to this point. Dianne attended Eastern University where she earned a Bachelor of Social Work degree. In 1986, she graduated from Marywood University with a Masters of Social Work. After school, she became a caseworker for seniors and then became the Director of Social Services at a skilled nursing facility. She has also worked as the Manager/Administrator of two assisted living facilities. Since 1993 she has worked on the development and management of retirement communities in New York, Pennsylvania, Michigan and Nebraska. Most recently, Dianne was the Executive Director of Adirondack Mennonite Retirement Community. “Through my work I’ve become keenly aware of the challenges seniors face throughout the aging process, as well as the difficulties adult children of aging parents encounter when trying to balance their personal lives, work and caring for a loved one,” said Dianne. Joanne earned a Bachelor’s degree from the SUNY system and her Master of Science in Education from St. Bonaventure University. At 19, Joanne entered the Sisters of St. Joseph and remained a sister for 23 years. As Sister Joanne Francis, she taught third through eighth grades as well as American History and Spirituality at Mater Dei College and served as a grade school Principal. In 1996, Joanne began a new career in substance abuse counseling. After working for 15 years in the field, Joanne started her own pet sitting business, which brought her into the hearts and homes of many older adults. “Dianne and I are both honored and excited to be able to use our gifts and talents to help seniors throughout Jefferson, Lewis and St. Lawrence Counties,” said Joanne. Dianne and Joanne have been together since 2000, and share their home with two dogs, Kody and Ebony and two cats, Idgie and Simba. They have both lived in Watertown and the North Country for almost 15 years and love the area because of the change of seasons, small town living, the beautiful countryside and the proximity to bodies of water such as Lake Ontario and the St. Lawrence River. In addition to their hard work in their separate careers, they are both very involved in their church. Dianne is both a past and present chair of the Finance Committee and Joanne is a past Trustee and current Deacon. They both volunteer with Team Hope, a local group of friends who raise funds to assist others with high medical costs. They also volunteer with the National MS Society, National Cancer Society, the Alzheimer’s Association, Special Olympics, Hospice and SPCA.